This is an EXCLUSIVE interview with Rendy Lu Yen-Hsun (盧彥勳) who is now training in Kenya. Rendy is currently the world no. 64, just one rank behind Kei Nishikori. Which player is your idol who inspires you a lot especially at the beginning of your career? I liked to watch Peter Sampras playing when I was a kid, especially, when he played in Wimbledon. And because of him my family yearn for it, until I turned pro and playing in the Grand Slam is always my big aim. You are the no.1 Asian tennis player before Kei overtook you in the recent revised ranking. What do you think about Kei? How do you feel about the emergence of Kei? Does this inspire you to work even harder? He is gifted, has good moves and plays aggressively. I think it is good, but I am training with my own way, I will not be changed by anyone, we learn from each other, make progress together, so for us, this kind of drives us to be better. Can you share with us how he felt when you beat the world no. 4 Andy Murray at the recent Beijing Olympics? What actually motivates you to win at that match? Excited, that proved to the people that I can win the top players, and also makes me have more confidences when I play with them. Actually, I didn’t think about too much things before the match, I just told myself, it was my show, I would not treat him well, that’s what I thought in the time, and in the end, I really made it. Do you follow the music scene in Taiwan? Who is your favorite Taiwanese singer? A4: 我喜歡聽歌,但沒有特定的. 但我喜歡較慢的抒情歌,台灣有很多歌手都唱的非常的好,例如:王力宏 菜依琳 周杰倫…等. 每個真的都有不同特色,我會去選歌不會去選人. Yes, I do, but at random. I like some tender songs, We have lots nice singers in Taiwan, such like Lee Hom, Jolin Tsai, Jay Chou, they are all stylish. In the most of the time, I follow to the songs not the singer. Who is your regular practice partner when you are back in Taiwan? I spend most of my time living overseas, so when I am in Taiwan, I usually have physical training, then my brother will be my practice partner. But if we have some practice match, I will practice with some junior players, so my brother is one of the regular practice partners. Of all the tournaments you have participated, which match is your favourite or memorable ones? A6: 我喜歡英國女皇杯草地的賽是,因為那是我第一參加ATP單打會內賽的地方. 更重要也擊敗當時世界第二阿根廷選手(Guillermo) Coria ,我喜歡那邊的一切. I like Queen's Club because that's the place where I started my first ATP match. And also, it is the place where I won former world No.2 Argentina player Guillermo Coria, I like every single thing there. Why do you seldom play clay tournament? The main reason is, I was trained on the hard court when I was a kid, so for me, clay court is quite strange. So, I'd rather play on courts that I'm good at and give the clay court up. I need some time to train on clay court, and this is the thing what I need in the near future. I like Taiwan, because I have to travel around the world all the year, so I don’t have much time to stay in my homeland. Although Taiwan is my home land, but there are still lots places I haven’t been, and also Taiwan is the place where I can find myself. Which player do you like to cooperate with in the doubles event? For now, I will say Rainer Schuttler, because we have won an ATP doubles title. Playing with him, I feel like I can play what I want. 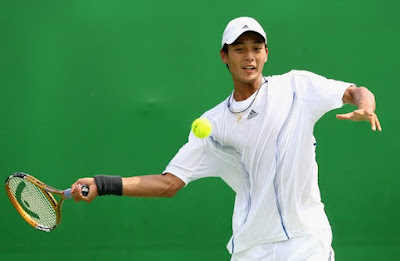 Do you see an Asian tennis player winning a Slam sometime in the next few years? I think nothing is impossible because nowadays, Asian tennis players have improved their games, but we still need some luck to win the Grand Slam, but I still believe, someday we will make it. Would you be interested in going to university someday? What subject area(s) are you interested in? I am interested in history indeed, but I can’t be sure what subject I will choose. History gives me lots of imagination spaces to know what happened before. I really have special feeling of it. What do you think could be done to further develop tennis in Asia? Lots, and some countries has already did a lot for the tennis, but as we all know, tennis in Asia, it started so late, so we still need to learn a lot from the countries which has a good tennis history. To get some information and experience from them. All in all, it still needs you to spend lots time on it, to popularize and develop it, so that tennis will become a popular event here in Asia, and our Asian players will play better than before. The first time I saw you play was in 2004 Heineken Shanghai, that time you played like a freshman who just turned to pro, but last year I saw you play in Beijing, you changed a lot. You are more confident, so could you tell us, what changed you? Lots of things makes me grow up and after playing so many matches, and during the injured times, they all have guided me to find the right direction. It looks very easy, but for sure, some times it really needs time to realize maybe one year, or maybe you can’t find the answer at all. But for me, I think, in the past few years, I’ve realized something not only in the court, but also off court, it all helped me a lot. I heard you scream in the court when I was watching you play last year in Beijing, it sounded like a word or something else, could you please tell me what is it? It is just my breath way, nothing special. 4 hours at least per day, and during the winter, it might be 6 hours, but during the match season, it depends on my body. Do you read when you get off from the court? What kind of book you would like to read? I like reading, it makes me calm. I like historical novel, very interested in it. Actually, my friend and I became a fan of yours since we met you in Shanghai 4 years ago, that time you were with your mum, you might forget, you were very shy, so in the most of the time, we talked with your mum. She said 'thank you' to us, till now, I never heard any tennis players did that like you do, so really impressed me. The latest time I saw you was the day in Beijing after you lost the game to Korean Lee, you were so close, but pity, you lost. You looked so sad when you came out from the court, I went up to you and asked for a picture, You gave me a sunny smile, I really appreciate! So my question is, What do you want to say to your fans wherever she/he comes from? Thank you all for your support and encouragement. To be honest, without your applause, your love, and your support nobody can become a good players, and you guys inspire me to fight to win matches. Special thanks to Esther for forwarding these questions to Rendy via his brother Thomas. Also thank you to Xin Yue of Shanghai who helped us to translate this Q&A. And thanks to Ali, Kino, Elvis, Zara and others in menstennisforums.com for the questions.